It is time to punt Little Green Footballs — 1389 Blog - Counterjihad! Click the above image for current Alexa stats for Little Green Footballs. I could read the handwriting on the wall. Since the onset of the huge feud that Charles Johnson deliberately started with Gates of Vienna and the rest of the antijihadist blogosphere, which involved Charles hurling very thinly substantiated accusations of fascist links to European antijihadist organizations, I could see that LGF had changed, and not for the better. Anybody who reads the comment threads can observe what the remaining members of LGF feel that they must do to prove their loyalty. They search constantly for any evidence of LGF members or ex-members expressing any support for, linking to, or communicating with anyone on Dear Leader’s ever-growing disapproved list. The old sense of camaraderie at LGF has long since vanished, along with most of the people with whom I would have wanted to exchange messages. There is nothing left but paranoia and a competition for who can launch the most mean-spirited ridicule against Charles Johnson’s latest batch of officially-designated enemies. Everyone who wants to remain an active member of LGF must fall in line, because if they don’t, sooner or later they’ll be banned too! I do a great deal of blogging and commenting that has nothing to do with LGF. 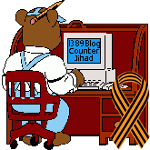 Just for starters, I am primary admin for 1389 Blog – Antijihadist Tech and for 1389 Message Blog. I post occasionally on Fort Hard Knox* and Screw the UN. I am a content creator on IMVU and am fairly active on Twitter. I have a gallery at deviantART. I comment regularly on many other sites. To remain a member of LGF, I would have had to drop all of the officially designated “nonpersons,” especially banned former LGF members, from the blogrolls and link lists on my own blogs. I would have had to be careful not to link to news stories from any proscribed persons or organizations in my own blog posts. I would not have been able to review those stories or mention them on Twitter or other sites I frequent. In other words, I would have had to surrender my own freedom of expression and association. This I was unwilling to do. True, I miss what LGF once was, or perhaps could have been, but I am realistic enough to see it for what it is. And it’s none of Charles Johnson’s business who else I cite or associate with. Why send LGF any more traffic? The conflict still continues at LGF. The last few remaining dissenters on LGF are speaking up, though not for long. After this blog post has been up for a little while, no doubt someone will post snarky comments on LGF about the infamous banned user 1389, same as they do with everyone else. But I have no intention of lurking on LGF to ego-surf for remarks about me. I have also removed the LGF news feed reader widget from the sidebar. If you still want it, you can get it directly from them. But why send LGF that extra little bit of traffic? LGF is no longer an antijihadist site, if it ever was. Whether Charles Johnson is consciously aware of it or not, LGF has gone over to the other side, or perhaps it has always been there. It is covertly helping our enemies by sowing dissention and by muzzling genuine antijihadist voices everywhere. LGF takes no part in activism against jihadism. Nor does it make any effort to help any other antijihadist sites or organizations. I have become convinced that LGF never had any intention of doing anything effective to begin with, and that this was the real reason for its boycott of Counterjihad Brussels 2007. LGF merely wishes to appear to be an antijihadist site, and to that end, it posts a sprinkling of terrorist news stories to draw readership. In other words, LGF is nothing more than a disguised version of Daily Kos or the ACLU. I don’t know who has bought out LGF, and I don’t even care at this point. Their declining traffic figures are already rendering them irrelevant. The saddest thing of all is that, some months ago, I helped LGF by launching a campaign to get them, and other sites, unbanned from various “censorware” blacklists. Before that, I had worked hard to promote LGF stories on Digg, against the efforts of the infamous “Bury Brigade.” Now LGF has retaliated, if that’s the proper word, by banning me. It is time to punt littlegreenfootballs, once and for all. Looking for former LGF members? Check out 2.0 The Blogmocracy. We get hate mail! See Little Green Footballs – Hitting New Lows, One After Another. The opinions of our authors, expressed in their posts on FHK or elsewhere on the web, do not necessarily reflect the opinion of FHK. We do, however, thank our authors for their contributions and their widely-varying perspectives on an impressive variety of topics. We have a really neat chatroom over there with many of the old friends you made at LGF. We support the First Amendment there so you are free to voice your opinion without fear of being censored or banned. C’mon by and I’ll buy the first round! I’d also like to extend this invitation to any and all the readers here including those that Sir Charles has seen fit to ban. Admin 1389 replies: I’ll take a look!? I got kicked of by CJ a few months ago for criticizing him on another site. He got my user name from the site, looked it up on his and disabled. It was for an anti-evolutionary comment I made on HotAir.com. I wasn’t a member of Little Green Footballs’ forums (it was too difficult to register). There’s still a form for submitting comments to the sit, though, so I tried asking Charles some tough questions about why he’s still slandering Rush Limbaugh and trying to paint him as a racist, and what happened? I was banned–from the entire blog! That’s right. When I try to navigate there, now, all I get is an error message stating I’m not allowed to access this server. Anyone who tells you Charles is fair and doesn’t ban people at the drop of a hat is lying. Admin 1389 replies: Consider being banned a badge of honor. You might want to post your name on the banned list at Kirly’s blog. I see that we have some loveable scamps nominating LGF for “best liberal blog” in the silly “weblog awards. sometimes when i come on here it really DOES look like a liberal blog. ease off on the creationist bashing. nobody cares about that. more on the big government 1995 page healthcare bill that nobody has read and that Pelosi wants to ram down congress and that’ll get your barometer back to where it should naturally be – on the centre right. note – i said CENTRE RIGHT.. i never thought of lgf as a neo con far right blog. but equally its not left wing. maybe you made a bad call on your choice of stories recently. i certainly noticed it. One thing I can do at my own blog is tell people who insult me to piss off, which is what I’m telling you. and that was it – banned. if he keeps doing that he’ll have zero traffic. Recommended reading: The (Official) list of the banned. Tells quite a story. And always the same story, you’ll see the pattern. Admin 1389 replies: LOL, thanks for posting this!